Hoover senior runningback C.J. Sturdivant breaks free from the pack. Journal photos by Marvin Gentry. 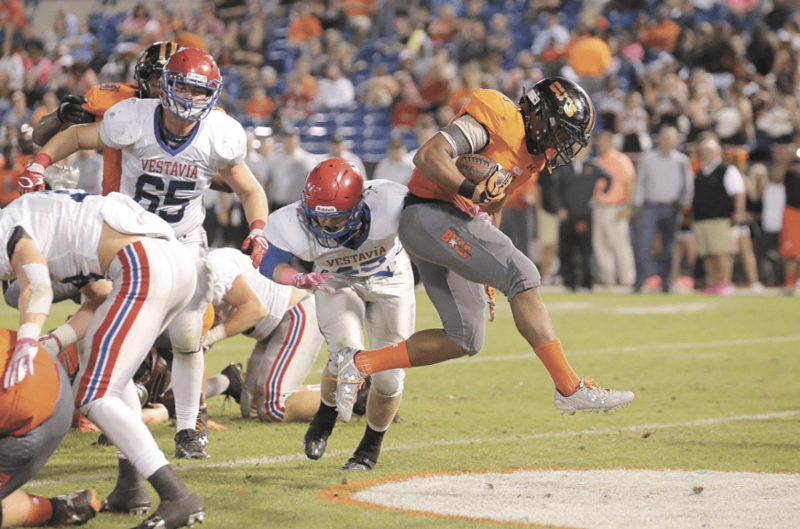 Left, Hoover held the Rebels to just 71 first half yards in their 38-7 Region 3 win. Buddy Anderson has earned 324 victories in nearly 40 years as the head coach of the Vestavia Hills Rebels. Few of those wins were sweeter than the ones over the Hoover Bucs. For all of Hoover’s success in the past two decades, Anderson’s Rebels have always been a tough nut for the Bucs to crack. For example, in 2015, Vestavia stunned its heavily favored rival 20-13 in the regular season, before Hoover avenged the loss in the playoffs. Overall, Anderson claims 19 career victories over Hoover, including its time as Berry High School, by far the most wins any coach has ever collected against the Bucs. The national media thinks so much of the Hoover-Vestavia matchup that it has honored it as a game in the prestigious Great American Rivalry Series. 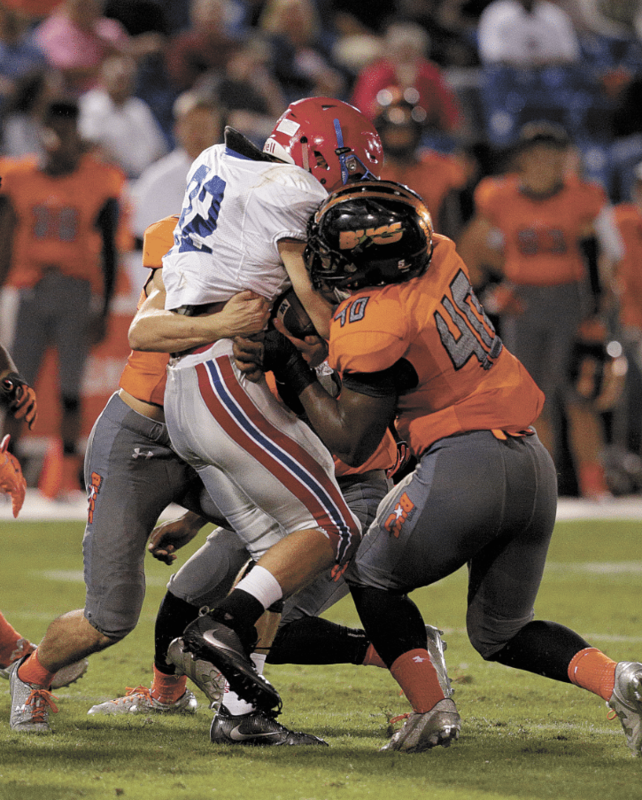 Anderson and Vestavia’s strong tradition against Hoover was enough to make Buc partisans uneasy about last Friday night’s clash, despite the Rebels’ comparatively modest 4-3 record. Their worries were to be unfounded. 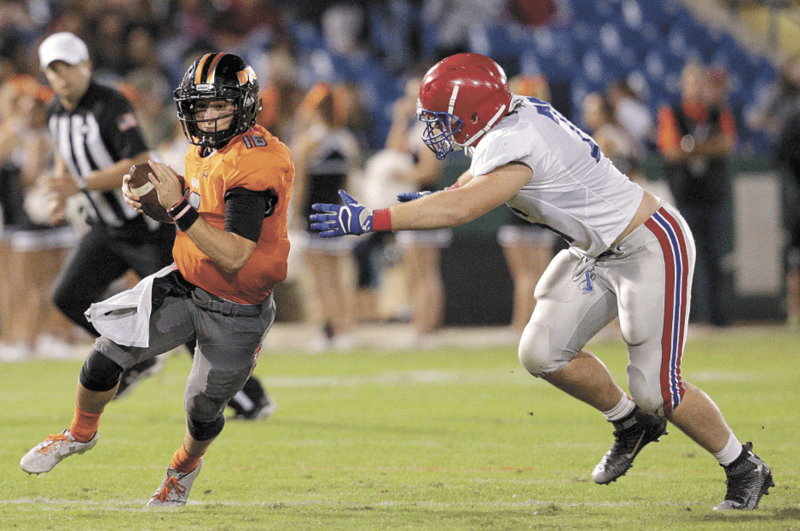 Hoover took control quickly, overcame an early turnover and rolled to an impressive 38-7 victory at the Hoover Met. 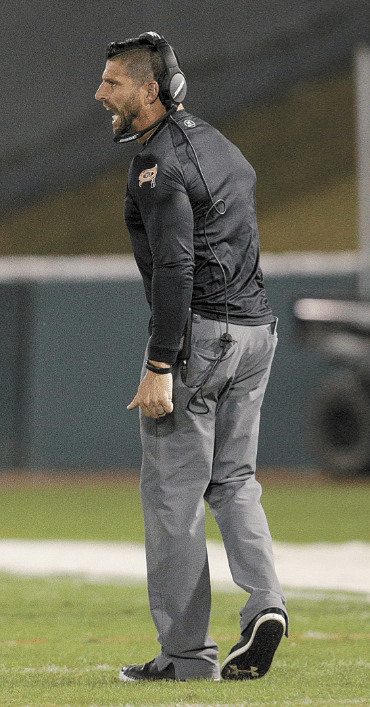 Right, Hoover coach Josh Niblett said his team We played to win – not just to keep from losing. It took the Bucs only six plays to take the lead. Quarterback Garrett Farquhar passed 21 yards to Shedrick Jackson for the touchdown to give the hosts a 7-0 lead. A few minutes later, C.J. Sturdivant scored on a one-yard run to raise the margin to 14-0. Hoover scored two more times before halftime to move its margin to 28-0. Shedrick Jackson tossed a halfback option pass to Kam Ford for the third touchdown. Farquhar’s scoring pass to Joseph Timpa provided the fourth score. The Buc offense compiled a whopping 302 yards in the first half, holding the Rebels to just 71. Hoover never punted in the game. Vestavia earned a consolation touchdown late in the contest when quarterback Coleman Petway connected with Joseph Travis for a 12-yard score to avoid the shutout. The Bucs have only averaged giving up six points a game since yielding 25 points in their loss to Allen High School of Texas on Aug. 26. The Buc offense led by quarterback Garrett Farquhar compiled a whopping 302 yards in the first half. With a 7-1 record and only Thompson remaining on its Class 7A Region Three schedule, Hoover looks ready to make another serious run for a state championship. If the Bucs can repeat their effort against Vestavia, it will take a special team having its best night to keep them out of the Class 7A final. Niblett is right. Every game is important. But as any Hoover fan knows, beating Vestavia is always a special occasion.